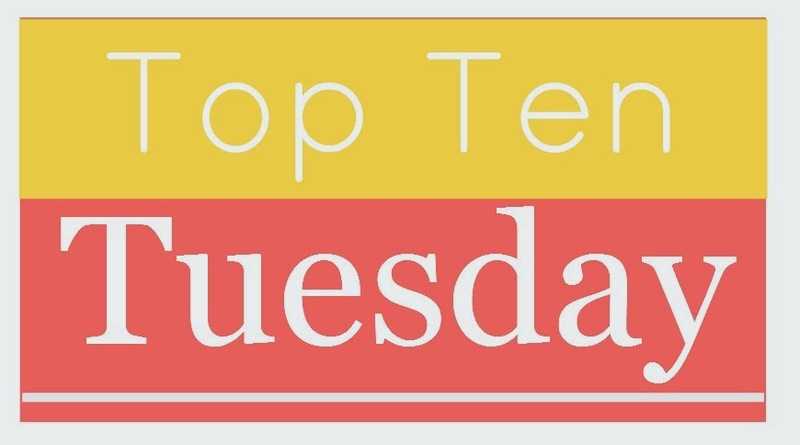 Even though I have a million other things I should be doing right now, I didn't want to miss out on this week's Top Ten Tuesday. The question this week is: What are (were?) your favorite reads of 2014. I can't wait to see what's on everyone's lists! Are there any last minute books I need to buy for myself Santa to bring me? If you want to join in the TTT fun, hop on over to The Broke and the Bookish and sign up. It's lots of fun! 1.) Forbidden by Kimberley Griffiths Little—I loved this lush historical YA novel set in the exotic Mesopotamian desert. It's full of romance, danger, adventure, and heart. Thanks to the extremely generous Little and her publisher, HarperCollins, I ended up with an extra copy of Forbidden. So, I'm going to pass it on to one lucky winner. You'll love this beautiful hardcover volume, with its gorgeous cover and riveting story. Use the Rafflecopter widget below to enter. Giveaway will end December 31, 2014 and is only open to residents of the U.S. and Canada. Good luck! 2. Everything by Kate Morton—No, the Australian author does not have a new book out (I wish), I just can't choose which of hers I like best. Since I read all of her wonderful novels this year, I'm going to count all four as my favorites. 3. UnWholly and UnDivided by Neal Shusterman—The UnWind series has been a favorite ever since I started it. I read the last two installments this month and they're just as good as the first ones. The whole series is excellent—exciting, original, and thought-provoking. I highly recommend it. 4. Cress by Marissa Meyer—The Lunar Chronicles is another of my favorite YA series. It's original, clean and fun. I loved the third book just as much as the first two. I've already purchased tickets for my daughter and I to see Meyer when she comes to Arizona in February! 5. The Secret Place by Tana French—All of the books in French's Dublin Murder Squad series are intriguing and well-written. I thought The Secret Place was especially clever because it took place over just one day. 6. Brown Girl Dreaming by Jacqueline Woodson—I've long been a fan of Woodson's lyrical, thought-provoking fiction. This memoir-in-verse is different, but just as compelling and thoughtful. 7. Big Little Lies by Liane Moriarty—Lots of people are raving about this entertaining novel, which is both laugh-out-loud funny and heartbreaking. 8. Bone Gap by Laura Ruby—This very original novel doesn't come out until March, but it's one you'll want to keep on your radar. I loved it because it was suspenseful, unique, and had a twist I've never encountered before in fiction. Ever. 9. Save the Cat by Blake Snyder—This book on screenwriting is a must-read for any would-be novelist. It breaks down the elements of a good story in a way that's logical, entertaining and kinda mind-blowing. 10. Bones Never Lie by Kathy Reichs—The latest installment in one of my favorite adult series, this book gave me all the feels. I pretty much swooned over the ending. Love. What fabulous books did you read this year? Which should I be adding to my TBR list? Forbidden looks fabulous! Thanks for the giveaway. Reading all these Top Ten lists is making me crazy. There are so many that I haven't even read a single book from and I want to read them *all*! I haven't read any of your faves, but I do have some of the series lurking on Mt. TBR that I need to get started on. And now I have a few more on my ever-growing wish list, too! Cress is one of my favorites too! Looks like I have some great books to read... Love your top 10 lists. And yay for A giveaway, love me a free book. Well, I haven't read any of these :-) but I am familiar with Tana French and HAVE read the first book of the Lunar Chronicles - which I liked a lot - but just haven't gotten to the rest of the series yet. We had an author, Malinda Lo, visit Indy recently, and she is the author of "Ash" which from what I understand is yet another spin on the Cinderella story (an LGBT version). I asked her if she was also familiar with Marissa Meyer's books and she said yes and that the publishers often have the two of them do book events together. I haven't read any of your picks! I did read Tana French's In the Woods already but it didn't stand out to me... I ought to give her another chance. And I've heard so many great things about Brown Girl Dreaming. Hope you have a great year of reading in 2015! I hadn't even realized Unwind was a series until recently! Glad to know that the other two books were fabulous. Oh I really want to go to the Marissa Meyer event in February! I need to convince someone to go with me. Sadly I haven't read any of these but I have recommended some to others. Ha! Specifically Little Big Lies and Tana French (both of whom I look forward to reading). Brown Girl Dreaming is another one I'd love to pick up. I love the variety of your list! I haven't read most of these, but several (Forbidden, Brown Girl Dreaming) are in my TBR pile. I didn't love Cress as much as the earlier books in the series, but I'm sure I'll read the sequels just like everyone else . . .
Great list! I haven't read any of them, but I will read Cress soon. Cinder made my list since I just barely read that, lol. I have been meaning to read Brown Girl Dreaming! I've heard some great things about Jacqueline Woodson - same with Kate Morton. She always pops up in the Aussie book lists. Save the Cat sounds interesting as well. I'm constantly coming up with little vignettes that would work great in my "someday novel" but I'm terrible at putting together a cohesive story, so I'll have to check that one out... You have such a diverse list! I'm so intrigued by Forbidden. What a beautiful cover! After reading your review, I know I want to read FORBIDDEN! Forbidden looks great! I'm a big fan of historical fiction, and YA means it'll probably be short, haha. Adding it on Goodreads now. I need to get to the UnWind series. I got the 2 books for 5bucks each for last years black Friday but haven't gotten to them yet. Forbidden is on my TBR list. Thanks so much for the chance to win a copy. You have such a great variety of books here! Thanks for the giveaway! I read BIG LITTLE LIES, too, and enjoyed it, but I thought Liane Moriarty's THE HUSBAND'S SECRET from last year was even better. Much more emotionally gripping and better written. Have you read it, Susan? The husband's secret is not what people first think it is . . . but something that will break your heart. So glad I found your blog and this contest! Thanks!